Complete Shepard's citations for U.S. Supreme Court decisions and statutory references. For pricing or to place an order, please contact us at 1-877-394-8826. Shepard's United States Citations contains Shepard's materials for U.S. Supreme Court cases so you can see how a case was subsequently treated and where it was cited so you can more easily determine how the decisions and statutory enhancements by Congress affect your case and expand your research to develop more thorough legal analysis. Shepard's has been a trusted name in legal research for over 100 years and saves you time and costly errors by helping you quickly validate your research to build your arguments efficiently and reliably and ensure you have good law. 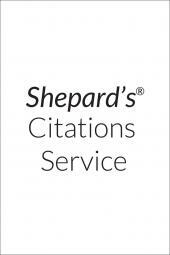 Shepard's can also help you begin your research by providing relevant cases, statutes, secondary sources, and annotations that cite your authority. Shepard's material is only available from LexisNexis, an electronic research pioneer for over 40 years and the name you trust for all your legal research needs.